Categories: Brookhaven Instruments, Governmental Research, Industrial, Industries Served, Particle Characterization, Universities. For samples near the I.E.P. 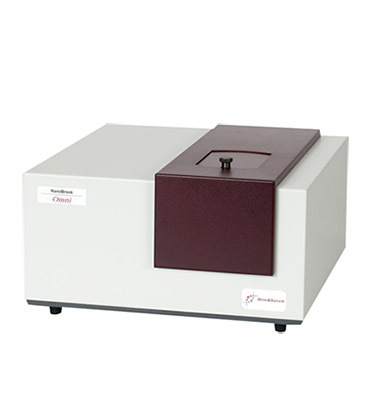 Brookhaven’s NanoBrook Omni instrument combines the best technology from our particle/protein sizer and zeta potential analyzer in to one powerful and accurate solution for sizing and zeta potential analysis. Measure samples in nearly every possible suspension environment from high salts such as PBS and sea water to organic solvents and of course aqueous solutions. Particle and protein sizing, with the highest sensitivity, utilizing three measurement angles for truly unbiased measurement results. The NanoBrook Omni utilizes a backscattering angle as well as 90° and 15°. The NanoBrook Omni is the one true “All-in-One” solution to particle and protein characterization. Simple fluids like water (low viscosity), glycerin (high viscosity) are Newtonian and exhibit viscosity effects, the dissipation of energy when particles move in such fluids. But dissolve macromolecules in these liquids –synthetic or biopolymers—and networks can form. In addition to viscosity effects, there are now elasticity effects, the storage of energy when embedded particle move. By following the mean square displacement (MSD) of tracer (probe) particles in such fluid and microrheological properties such as η*, the complex viscosity, G″, the viscous loss modulus, and G′, the elastic storage modulus, can be determined as a function of frequency. Measurement of the autocorrelation function (ACF) using DLS techniques yields the MSD of tracer particles, which, under the right conditions, can be used to determine η*, G″, and G′ over a range of frequencies much higher than mechanical rheometers can attain. Much smaller sample volumes, in the microliters, are possible compared to mechanical instruments. Finally, since strains result from the thermally driven motion of tracer particles, these much smaller strains allow the study of fragile samples. The study of viscoelasticity in aggregating dilute protein solutions is a prime example of the benefits of DLS microrheology. The new NanoBrook Omni particle size and zeta potential analyzer incorporates all you need for fast, routine, sub-micron measurements of size and zeta potential. Based on the principles of Dynamic Light Scattering (DLS) for particle sizing and distribution, and based on doppler velocimetry (electrophoretic light scattering, ELS) for zeta potential measurement, most measurements only take a minute or two. The instrument also includes Phase Analysis Light Scattering (PALS) measurements for samples with low mobilities. Measurements of traditional colloids are usually made at 90° scattering angle due to the unbiased results measured. For nanoparticles and proteins, IgG and peptides, these < 50 nm samples can be measured using the backscattering angle (173°) for best S/N and reproducibility of measurements. Finally the 15° detection angle can be selected for added sensitivity with aggregation measurements. Zeta potential measurements are always performed using the 15° detection angle to minimize diffusion broadening. Dilute suspensions, on the order of 0.0001 to 1.0% v/v are prepared, using suitable wetting and/or dispersing agents, if required. A small ultrasonicator is sometimes useful in breaking up loosely-held agglomerates. At 173° sample volume may be reduced to 50 µL with a polystyrene, U-shaped, disposable cuvette and the sample is recoverable. At 90° square polystyrene or glass cells (two or three mL) are used, one as small as 10 µL (non-disposable). In addition, disposable, glass round cells with reusable Teflon stoppers are used for aggressive solvent suspensions. In all case, just a few minutes are required for the sample and cell to equilibrate with the actively controlled temperature environment inside the NanoBrook Omni. Perhaps the most important benefit for users is the reproducibility from sample-to-sample, operator-to-operator, and instrument-to-instrument. The table below shows the results obtained for a polystyrene latex. Notice the Std. Error of the Effective (or Average) Diameter is less than 1% of the mean of the 10 repeated runs; the duration of each run was only five minutes. Such excellent repeatability is typical of the 90Plus for even routine QC analysis and ensures product quality time-after-time. The following table shows several aspects of the inter-instrument repeatability found with routine Brookhaven dynamic light scattering equipment. To test the reliability of the information obtained with Brookhaven Instruments a customer subjected five instruments in five locations with different operatorsand using four different samples to examination. The tabulation below shows excellent reproducibility with recognized standard materials and superb internal agreement. You can be confident of the results you get with your NanoBrook Omni! 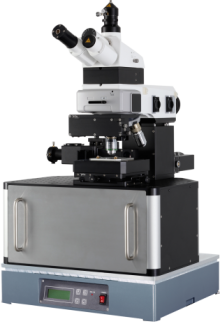 The unprecedented all-in-one alpha300 RAS combines Raman, AFM, and SNOM imaging in a single instrument for the utmost flexibility and sophisticated sample characterization. 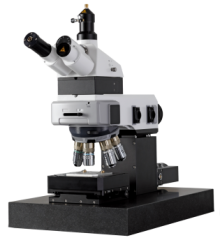 The imaging capabilities of the alpha300 R fulfill the highest requirements of confocal Raman imaging with superior performance in speed, sensitivity and resolution. These unique characteristics have established the alpha300 R the preeminent confocal Raman imaging system on the market.